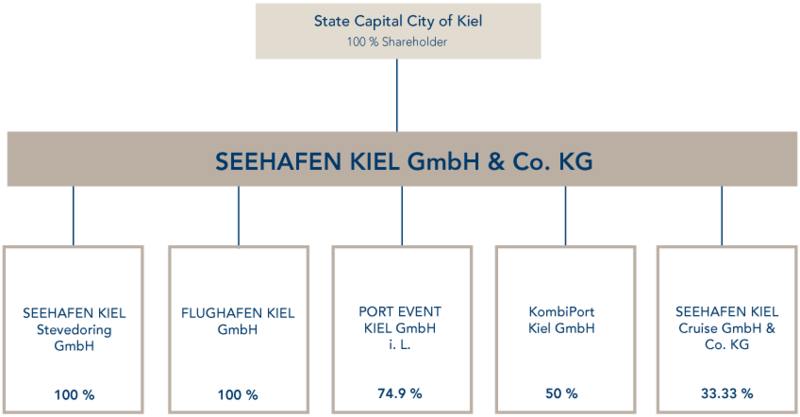 The SEEHAFEN KIEL GmbH & Co. KG (PORT OF KIEL) owns the public facilities and infrastructure in the commercial port, is responsible for the development of the port as well as for investments and expansion. It is also in charge of maintaining KIEL AIRPORT and the public port rail infrastracture. The company is a 100 per cent subsidiary of the federal state capital Kiel and has six subsidiaries and associated companies. Loading and unloading goods in sea transport is the the field of expertise of our subsidiary! Next to handling rolling cargo, crane and container handling as well as combined traffic, PORT OF KIEL Stevedoring offers a broad portfolio of services. Cruise shipping is the epitome of worry-free and all-inclusive travelling. PORT OF KIEL Cruise has specialised in the services of a turnaround port: Mooring services for cruise ships, luggage handling at Kiel's terminals, luggage transfer as well as provisioning. Kiel Airpark is the vital commercial area featuring a runway on the premises of KIEL AIRPORT and offers best conditions for further ambitions targeting Light to Midsize Jets and helicopters that regard Northern Germany as their airspace. Book one of Kiel's ferry and cruise terminals for your event as e.g. parties, concerts or trade shows. The event areas in the terminals can be rented on a daily basis. Furthermore, we rent out attractive outdoor areas in the port of Kiel for open air events. KombiPort Kiel GmbH is a joint venture of SEEHAFEN Kiel GmbH & Co. KG and the German company for combined traffic "Deutsche Gesellschaft für den kombinierten Güterverkehr mbH & Co. KG" in Frankfurt am Main. KombiPort manages the handling facilities for combined transport at the port areas Ostuferhafen and Schwedenkai. mainline services. The rental locomotives are in long, mid or short term operation all over Germany and in the neighbouring countries.